Agriculture in the United States is a $200 billion dollar industry, $19 billion in Illinois alone. Recently, weed resistance to chemicals has caused losses of $4-$6 billion per year, a number that experts say could rise to $100 billion per year if chemicals continue to lose efficacy. Scientists at the University of Illinois at Urbana-Champaign are working on research funded by the U.S. Department of Agriculture that would remove farmer reliance on chemicals to destroy weeds. The Illinois scientists' goal is to create collaborative and autonomous robots that would weed fields using mechanical implements in lieu of chemical formulas that have lost efficacy due to repetition. Specifically, weeds have developed resistance to the herbicide glyphosate, used to treat commodity crops for nearly two decades. In addition to the resistance issue, chemical herbicides can only be applied before a crop canopies and shadows the ground beneath it. Once the crop has reached this point, the farm machinery used for application could cause damage to the growing plants. "Big equipment can't reach between plants after they've grown to a certain point," said CSL's Girish Chowdhary, assistant professor in the Department of Agricultural and Biological Engineering, with appointments in Electrical and Computer Engineering, Computer Science, and Aerospace Engineering. "The robots could autonomously and continuously go through and take care of the weeds underneath the canopy." The rapid, widespread proliferation of herbicide resistant weed genotypes, combined with a slow-down in the herbicide discovery pipeline, have left farmers with a dwindling number of chemical tools for weed management. Chowdhary and his group of scientists hope their research will result in farmers having a team of reliable, proficient, and cost-effective robots as a sustainable weed management option. Researchers from a wide variety of disciplines are coming together to build AgBots that are capable of meeting this goal. "The project is necessarily interdisciplinary," said Chowdhary, the project's principal investigator. "When trying to solve meaningful problems you need experts from different areas to come together." In addition to Chowdhary's robotics expertise, the team includes experts in machine learning, weed scientists, and environmental ecosystems specialists. To an untrained eye, young row crops and weeds can look very similar. Even after the commodities have grown, the robots would still need to be able to tell the difference between a corn stalk and a water hemp plant. That is where fellow CSL Professor R. Srikant's machine learning and deep learning expertise comes into play, applying fundamental principles that would allow the robots to acclimate to real-world uncertainties experienced in the field. As shown in this video provided by Chowdhary, the robots currently under development can determine in real time, the difference between a cash crop and a yield-robbing pest. Adam Davis, head of the U of I Department of Crop Sciences, provides agronomic expertise with his years of weed management experience. Rounding out the group is Chinmay Soman, a natural resources expert and CEO of the company EarthSense, which helps build the robots designed by the team. 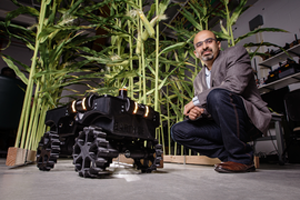 In addition, Chowdhary and his team have succeeded in developing an autonomous robot capable of traversing variable conditions in a crop field. The research dedicated to the robot that led to the current work was awarded the Best Systems Paper at the Robotics: Science and Systems robotics conference this past July. The next step is to build an arm that would be responsible for the weeding action of the robot. For the preliminary arm design Chowdhary is relying on a Mechanical Engineering senior design team made of undergraduate students. "We have several graduate research assistants and we're trying to get undergraduate students involved as well," said Chowdhary. "As part of the grant, we have a specific expectation to get more women and minorities involved in the research and that's one of the things we really want to do." The potential impact this project could have on farmers and the agricultural industry as a whole could be huge, according to Davis. "This project could revolutionize integrated weed management, giving farmers a novel, highly effective tool for physical weed control while reducing reliance on, and improving stewardship of, herbicides," Davis said. With researchers from both the College of Agricultural, Consumer and Environmental Sciences (ACES) and College of Engineering (COE), this project is an exciting example of the innovative cross-cutting research at the University of Illinois Urbana-Champaign that underlines the need for the recently formed Center for Digital Agriculture. The USDA provided $886,157 to fund the project. The project was evaluated and funded through the National Science Foundation and National Institute of Food and Agriculture (NIFA) joint Cyber Physical Systems program.